This moustache guard cup (available in right and left handed versions) pays homage to British potter Harvey Adams, who in the 1860's invented this incredible device for keeping ones pampered top lip topiary safe and dry. Enjoy sipping your tea, coffee or preferred beverage through the opening... keeping a stiff upper lip regardless. Delivery will be via Royal Mail, first-class delivery (£5.00). Your order will usually be dispatched within 2 working days. 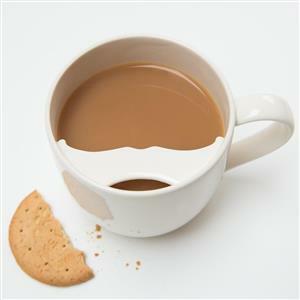 We will notify you by email once your Moustache Guard Cup has been dispatched.